Motorists, including truck drivers are being warned of the dangers of sun glare. Countless collisions have occurred due to blind spots created by sun glare and the distance perception problems that are created. 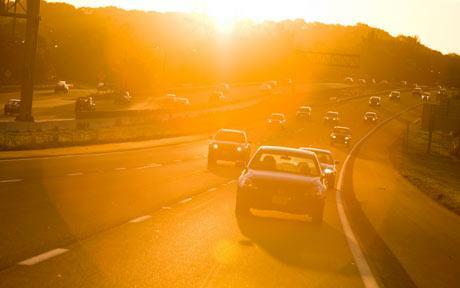 Driving directly against the sun can also block peripheral areas of vision and cause sudden moments of blindness as the sun peeks out from behind surrounding objects. It can make using the road for pedestrians and cyclists very challenging also as it can be very difficult for motorists to see them. Like beauty, glare is often in the eye of the beholder. Drivers middle-aged and older are more sensitive to glare than younger drivers because their eyes take longer to adjust to changing light levels. For example, a 55-year old takes eight times longer to recover from glare than a 16-year-old. As the population ages, the number of older drivers will continue to rise as will the number of complaints about glare. Lighter-coloured eyes are more sensitive, which means the lighter your eyes are the more glare will bother you. Certain other conditions, such as having had vision-correction surgery that affects the corneas, may also increase your sensitivity to glare. James Loughman, Professor of Optometry and Vision Science at Dublin Institute of Technology added: “Individuals who suffer dry eyes often find their symptoms worsen during driving. This has the additional effect of increasing glare as a result of ocular irritation and an irregular tear film. Our research at Dublin Institute of Technology has also revealed that macular pigment plays a critical role in glare sensitivity.This pigment, which accumulates in the retina, filters the light as it strikes the retina and removes the components that cause glare much in the way that polarised sunglasses work. In essence, this pigment is the eye’s natural protection against glare”. Unexpectedly, our diet is an important factor for both tear function and macular pigment protection against glare. Evidence exists, for example, that omega-3 fatty acids have a beneficial effect on tear function. Macular pigment is entirely of dietary origin and is typically deficient in Irish adults due to the lower than average intake of leafy green vegetables such as spinach or kale. This may predispose individuals to increased risk of glare and potentially to certain eye disease such as age-related macular degeneration. Importantly, however, Prof. Loughman states that “our research has shown that dietary supplementation with macular carotenoids in the quantities found in the commercially available supplement, Macushield, can alleviate glare sensitivity, while the use of artificial tears can have similarly beneficial effects on glare disability in the case of persistent dry eye”.